The elastic band release is a quick trick that requires some deft moves and clear thinking, but once mastered is easily done. Only the magician can cause an elastic band to fall from between linked fingers, and while it can be figured out, it is worth a few laughs while it is being puzzled. The magician takes out an elastic band and shows the spectators. He runs his two index fingers round and round inside the band, then touches his thumbs to his fingers, claiming he can cause the elastic band to fall from within without unlinking the fingers. With a deft motion, the band indeed falls to the floor, while the fingers remain touching. A slight turn of the hands and a “trading off” of linked fingers causes the elastic band to fall free. One elastic band of normal size and a bit of practice and you will be ready to go with this trick anytime, anywhere. The whole of this trick relies on a “secret move” and bit of implied fibbing. The trick is one you will only be able to do for the same crowd in one session, as they will likely figure it out after a few attempts, but not before you have established yourself as the holder of secret mysteries and strange abilities. 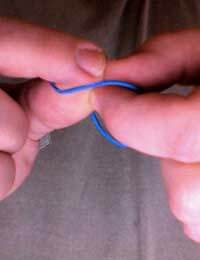 Place both index fingers inside the elastic band. Both hands should be positioned with the thumbs facing your body, and the rest of your fingers held loosely closed. Rotate your fingers around each other inside the band to show that it is a normal elastic band. Touch your thumbs to your index fingers. The band is now effectively trapped as long as index fingers and thumbs are touching. Here is the secret move - as you bring your fingers of both hands together to touch, rotate them slightly in opposite directions. You should end up with the left index finger touching the tip of the right thumb, and the right index finger touching the tip of the left thumb. Keeping your fingers in contact with those of the opposite hand, open the fingers of the same hand. In other words, your right thumb and index finger separate, as do your left, but your left index finger is still in contact with your right thumb, and your right index finger is still in contact with your left thumb. The band will fall free to the floor. It is essential that you practice the secret move over and over, as it is a little unnatural at first. Once you have it down, however, it will come quickly and naturally. It helps to think of making a “quarter turn” with your hands, again moving in opposite directions, when you make your secret move. The key is how smoothly you do the secret move, but also how smoothly and quickly you separate your “same hand” fingers, allowing the band to fall. The entire motion - secret move and opening of the fingers - needs to be one continuous flow to hide what actually happened. Your mates will eventually figure it out, but not before you’ve had a little fun.